Music Web International: Recording of the Year; Gramophone: outstanding. 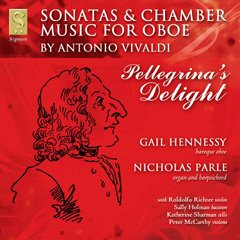 Pellegrina’s Delight celebrates Vivaldi’s contribution to oboe repertoire in the early eighteenth century. Vivaldi wrote at least 16 concerti for solo oboe, but in this recording we offer an overview of Vivaldi’s prominent use of the solo oboe in his chamber music. The disc also provides a fascinating illustration of Vivaldi’s stylistic development between c.1705 and c.1720.